GERRISH, MOSES, settler, jp, and office holder; b. 10 June 1744 in Byfield Parish, Newbury, Mass., son of Moses Gerrish and Mary Moody; m. 13 Oct. 1774 Ruth Ingalls in Andover, Mass. ; d. 30 July 1830 off Grand Manan Island, N.B. Moses Gerrish’s loyalty to the British cause was constant. Forced to leave his home in Massachusetts during the American revolution, he found shelter under British protection in the District of Maine. When at the end of the war that territory was ceded to the United States, he was again forced to relocate. He settled on Grand Manan Island in the Bay of Fundy. For three decades it was uncertain to which of the former combatants, Great Britain or the United States, the Fundy islands belonged. 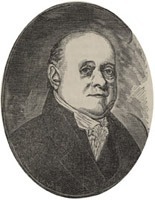 In a letter of 20 Feb. 1817 to Ward Chipman, the British government’s agent before the boundary commissioners, Gerrish wrote, “As I am arrived so near to the close of life it would be a serious mortification to lose Grand Manan and be compelled by my Countrymen to move again, or live under their Government.” In another statement he noted that, had there been any insinuation in 1783 that Grand Manan belonged to the United States, he would have withdrawn his petition for a grant of the island. He wanted no part of the republic, and much to his relief the island was ceded to the British crown later in 1817. Gerrish had entered Harvard College in 1758, graduating as an ab with the class of 1762. He was a school teacher for several years in settlements along the upper Connecticut River, but at the beginning of the revolution he and a brother, Enoch, went to live on land owned by the family in Lancaster, Mass. Charged on 30 June 1777 with being “Dangerous persons to this and the other United States of America,” they were arrested and their property was confiscated. A year later they were released on a technicality, but within two days an order was issued for their rearrest. Fortunately, the interval had given them time to escape. In October 1778 it was revealed that Moses had been active in passing counterfeit money printed by the British in New York in order to deflate local currency. Gerrish next appears as an officer in the commissariat at Fort George (Castine, Maine), which had been built at the mouth of the Penobscot River in June 1779 by a British military expedition under Francis McLean*. He was soon involved in the successful defence of the post when it was besieged for 21 days by American forces in July and August. The ultimate aim in establishing the fort had been to create a British province, to be called New Ireland, that would extend from the Penobscot to the St Croix River and would serve as a haven for loyalist refugees [see John Caleff*]. However, under the terms of the treaty of peace, agreed to on 30 Nov. 1782 and signed on 3 Sept. 1783, the proposed province was included in United States territory. In the mean time, the Penobscot Associated Loyalists sent emissaries to survey the land just east of the St Croix, in Nova Scotia, and it was here they would settle. By January 1784 all of the loyalists, Gerrish among them, together with discharged soldiers, had been evacuated from the Penobscot area [see William Gallop*]. Although Gerrish obtained a shore lot on the mainland of what is now Charlotte County, he chose not to settle there. On 30 Dec. 1783 Governor John Parr* of Nova Scotia issued a licence to John Jones, Thomas Oxnard, Thomas Ross, Peter Jones, and Moses Gerrish “to occupy during pleasure the Island of Grand Manan and the small Islands adjacent in the fishery, with liberty of cutting frame Stuff and timber for building.” Hoping to obtain a grant of Grand Manan, the licensees undertook to settle a certain number of families there, but they were to be unsuccessful in attracting the required quota and the original plan would not be realized. Gerrish and his colleagues arrived at the island on 6 May 1784, in the same year that New Brunswick became a separate province, and a permanent settlement was begun. Thomas Oxnard and Peter Jones never exercised their share in the licence of occupation, and in 1786 John Jones sold his interests to others. Ross was a sea captain, maintaining a commercial link to the mainland with his vessels and carrying on a shipping business in his own interests. Though his family was established on the island, he was away from home much of the time. Gerrish was left to manage the civil affairs of the young community. Gerrish was appointed a justice of the peace. In that capacity he attended the Court of General Sessions in St Andrews, the shiretown of Charlotte County. He was named sub-collector of imperial customs for St Andrews as well and, although the speculation has not yet been substantiated, no doubt also served at the end of his life as deputy treasurer for collecting customs duties imposed by New Brunswick in its own right, it being a matter of convenience in 1830 to combine the two posts in the smaller ports of entry. Since, after its settlement, nearly four decades were to pass before there were resident clergy on Grand Manan, Gerrish also was made a commissioner for performing marriages. Among other initiatives, Gerrish purchased a pair of moose in 1784 and brought them to the island, where they soon multiplied. In 1810, when they were in danger of extermination, the provincial legislature passed a law for their protection, one of the earliest game conservation acts on record in British North America. An unusual feature allowed only Gerrish, or those permitted by him, to hunt and kill these big game animals. The law was later allowed to lapse and by 1835, only five years following Gerrish’s death, they had become extinct. The development of the young community on Grand Manan was not without problems. The claims of the first settlers to individual land grants were not recognized until 1806 and, in the 22 years that had passed since the community was established, occupancy of lots by new settlers within the licence system had created a number of unfavourable situations. On occasion the founders were accused, unjustly, of speculation in land to which they held no regular title. Before 1817 the inhabitants of the island had also to cope with the uncertainty resulting from the disputed boundary with the United States. Gerrish’s house was located on Ross Island, next adjacent to the main island. In 1830, when he was returning home from the performance of a marriage ceremony at Seal Cove village, about four miles distant by water, his boat capsized and he was drowned. His body was recovered and he was buried in what is now an unmarked grave on Ross Island. His wife, Ruth, died in Massachusetts five years later. The couple had apparently been parted for almost 50 years, and it can only be presumed that their marriage, like so many others, had fallen victim to war and revolution. Forty-six years of Gerrish’s life had been devoted to obtaining settlers for Grand Manan and helping to build what is today a thriving fishing community. That he had been unusually gifted for his role is more than evident. One man who knew him well said, “He would spread more good sense on a sheet of paper than any person of my acquaintance.” A later historian commented, “Life on Grand Manan must have had a peculiar charm for this solitary man, who could have filled with honour a much higher place in society.” Gerrish’s love for that magnificent island and his loyalty to Great Britain were what mattered most of all. Winslow papers (Raymond). Sabine, Biog. sketches of loyalists. Shipton, Sibley’s Harvard graduates. International adjudications, ancient and modern: history and documents . . . modern series, ed. J. B. Moore (6v., New York, 1929–33), 6. W. H. Siebert, The exodus of the loyalists from Penobscot to Passamaquoddy (Columbus, Ohio, 1914). Jonas Howe, “Letters and documents relating to the history and settlement of the island of Grand Manan . . . ,” N.B. Hist. Soc., Coll., 1 (1894–97), no.3: 341–65. L. K. Ingersoll, “GERRISH, MOSES,” in Dictionary of Canadian Biography, vol. 6, University of Toronto/Université Laval, 2003–, accessed April 20, 2019, http://www.biographi.ca/en/bio/gerrish_moses_6E.html.